It has been a long time coming, yet with the arrival of the Winter Hearth package (Which opened up a whopping 18 additional furnishing slots for me!) I've finally brought my dream homestead to life. 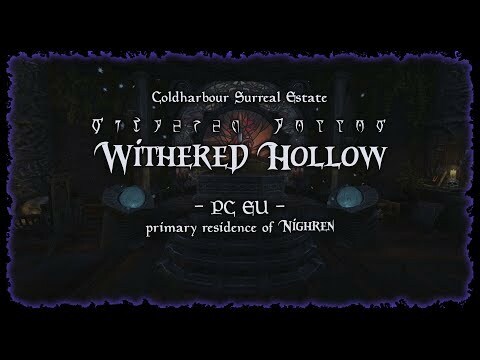 Welcome to Nighrens' Withered Hollow, a little secluded cavern hidden away deep within the desolate realm of coldharbour. While I had finished most of it shortly after the introduction of the Coldharbour Surreal Estate, I was never truly happy with it. This september I overhauled the Inner Sanctum completely, and now with the Winter Hearth Fireplace, I could at long last replace the awful fireplace that I made out of 12 orcish thrones and an assortment of fiery fireplaces. And yes, all crafting stations work, despite their placement. I hope you'll enjoy this 5 minute preview of my passion project! Wow! This so amazing @ShadowHvo ! It truly is a haven fit for vampire king! That's fantastic @ShadowHvo, so impressive! Thank you all for the kind words! I cannot stress enough how happy I am with the final result. Now heres to hoping that the furnishing cap will at some point be increased, so that I can get a bit more clutter in the kitchen bar and the workshop. Wow, this is like a Skyrim mod. It's one of the best put together homes I've seen on this forum. Amazing job, thanks for sharing. @ShadowHvo , this is absolutely fantastic job! Fabulous! I especially liked the quick pullback at the end, like a bat leaving its home. Oh wow. I am so impressed with this! Also, what IS that you have in the coffin? Spectacular! The mood and design is perfect, and the paneling in the Silencer's Reliquary is brilliant. omg this is absolutely amazing. I LOVE it! It's really, really fantastic. I'm so tempted to create a new character on EU just so I can see this in person! Definitely remember seeing the design on Nexus for SKyrim. Was a great mod back then. It is 10 [Redguard Pillow Roll, Desert Flame] tilted and turned to carefully hide the golden puffs at the ends inside the stone framework of the coffin itself. It took hell of a time to get just right, though I do love the finish! I do wish that we had coffins with some nice cushion though, so that I could spare those 10 slots. But alas! even a vampire like you and I deserve to rest comfortably! Very cool none the less! Looks gorgeous and you did excellent work. Thanks for sharing your work with us. The builds I tend to like the best are those that make each (or many) of the rooms a starkly different scene rather than a consistent style throughout, while still maintaining an overall theme. When viewing these types of builds, every time I approach a transition, I am excited to see what's next. The inventory and total cost at the end should be standard in videos. 10x awesome for that alone.